Easy access to everything including transportation, office personal were very thorough. Location is perfect! For restaurants and cafes. Perfect size apartment for me I was in the studio and didn’t need anything more. The location is very close to LA Rambla and lots of action just outside your door. The location was incredible! You could not ask for anything more centralized to everything you would want to experience. Great restaurants, fun nightlife, excellent sightseeing. We moved from #24 to #23 which was a much better fit for our family. The staff was very helpful in accommodating our move. The location of #23 was quieter and the apartment was larger. The location was great.....just down the street from La Ramblas, however that turned out to be a double edged sword as the apartment was VERY noisy all night. Not only from the street traffic, but also from the other tenants in the apartment. Another plus was all of the restaurants and cafes in the area. It had a locked entrance, and an elevator, which was terrific! The apartment was very tiny, but the itsy, bitsy kitchen was well equipped except for NO WINEGLASSES! In Spain! The check in process was very good, and there was a locked luggage storage area that was a big help. 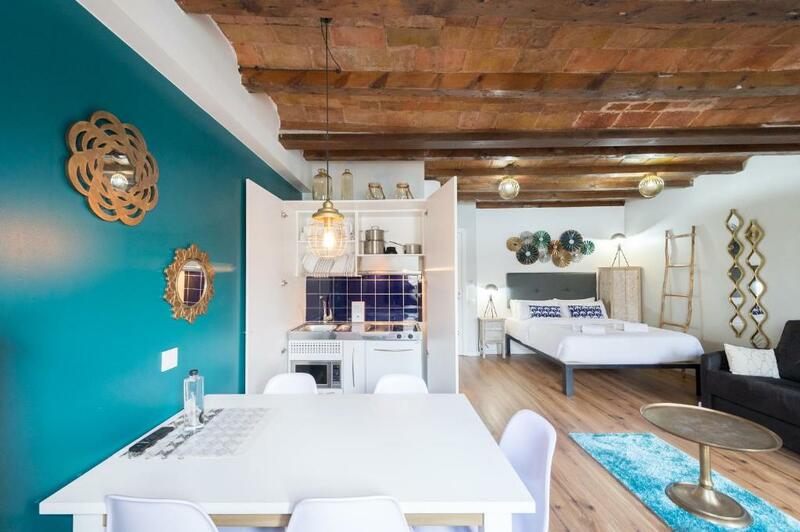 Perfect locatioand ( really mean it) , near to La Rambla street and metro station and short walk to plaza Catalanya, lots of restaurants,supermarkets near by , walking distance to aquarium. Great location, comfy bed, spacious studio overlooking the street, clean, safe (lots of security with elevator even requiring special action). I would stay here again if some of my issues below were fixed. Offering free WiFi and air conditioning, No 24 - The Streets Apartments is located in the heart of Barcelona. 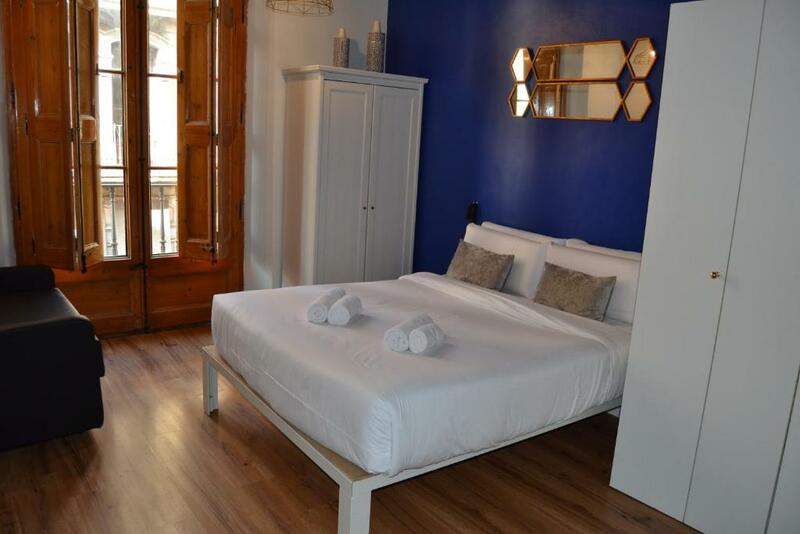 The apartments are 2 minutes’ walk from La Rambla. No 24 - The Streets Apartments feature a seating area with space for 4 people and a kitchenette including a stove and a toaster. The private bathroom features a shower, while towels and bed linen are included. A wide range of bars and restaurants can be found in La Rambla. Guests can also enjoy breakfast in a variety of cafeterias and bakeries located in Carrer Ferran Street, where No 24 - The Streets Apartments is set. Set in the lively area of Barcelona Old Town, the apartment offers easy access to Barcelona’s attractions and nightlife. Regular airport buses leave from Plaza Catalunya, 2,950 feet away. 뀐 Located in the real heart of Barcelona, this property has an excellent location score of 8.9! When would you like to stay at En Ferran by The Streets? Area Info – This neighborhood is a great choice for travelers interested in food, sightseeing and culture – Check location Great location - show map Guests loved walking around the neighborhood! House Rules En Ferran by The Streets takes special requests – add in the next step! A EUR400 damage deposit is required on arrival (around USD449.74). This deposit will be fully refunded 7 days after check-out, as long as there isn't any damage to the property. En Ferran by The Streets accepts these cards and reserves the right to temporarily hold an amount prior to arrival. After 01:00 to 11:00 EUR 50. Guests must call at least 30 minutes before arrival. Please note that check-in and key collection take place at: Carrer dels Escudellers, 18, Barcelona 08002. A damage deposit of EUR 400 is required on arrival. That's about 449.74USD. This will be collected by credit card. You should be reimbursed within 7 days of check-out. Your deposit will be refunded in full by credit card, subject to an inspection of the property. The double beds were really comfy but the sofa beds were not so much.. We were a couple of pillows short and short of one duvet on the first night so my friend slept under a towel, however the hosts dropped off another one the next day! Location & size of the apartment was excellent, bathrooms were great and check in experience was really simple! Its was a very noisy apartment(needs soundproofing you can sleep at night without earplugs), could be cleaner, very small bathroom. The studio was not cleaned, and there was not even toilet paper, not even shampoo or soap..
Didn’t like the late check in charge of 30 Euros! Check in had to be before 8pm! There were 2 other groups checking in at the same time! He only came once and checked in three groups so made an additional 90 Euros! I think the 30 euro charge should have been split by the 3 groups instead of each group being charged separately! Location and spaciousness of the apartment!! Nice to have the little kitchenette!! I did not like the fact that you can't make any changes, even from the top floor to the bottom. I would not recommend it at all, if you book it then you have no other options whatsoever. They have no mercy, not even a bit of understanding about the word MISTAKE! We were forced to stay while we were not happy 20min from the booking you are not allowed to change anything! I do not know why, I though that I could count with laundry facilities and there were none. Mostly, it is nice studio in a very historic location, extremely good location. There is a design flaw in the bathroom embedded in the studio, it does not vent well from the drainage. It is just normal damp drainage vent gases. That said, there is no quick fix. Just keep the window of the studio order for the return circulate more quickly. if you need to keep windows closed, it can be quite discomforting. Not really friendly staff. They need some customers service training. Location. Huge apartment with en-suite rooms. Staff not really clear with instructions, especially when needing to go to another location for check in / check out. Going to the checkout- the office wasn’t even open yet. PS. Please please fix the AC - as the noise was very disturbing! Great location and had everything necessary. Could be quite noisy at night times, if you have the room at the front. Didn’t stop us from getting to sleep at night though. Was in the centre of Barcelona, close to everything you needed. Nice little balcony which looked out onto the streets of Barcelona. We enjoyed everything about the stay.